Meatballs are always a hit with families. 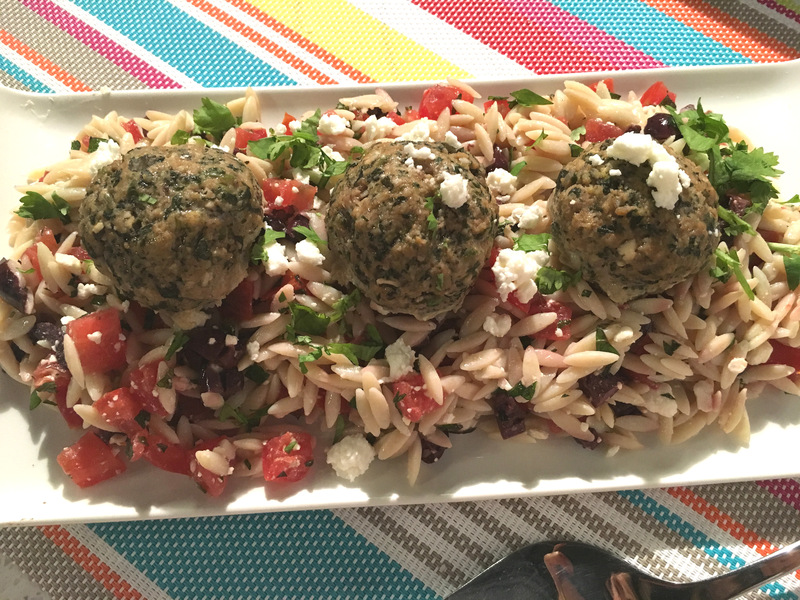 I’ve given a Mediterranean twist to these savoury meatballs and serve them over a bed of orzo, which is simply rice-shaped pasta. Add some diced tomatoes, olives, feta and mint and you have an upscale version of spaghetti and meatballs. 1. Preheat oven to 425 F. Line a baking sheet with foil and spray with vegetable oil. 2. In bowl combine beef, egg, onion, 1/3 cup feta, spinach, breadcrumbs, ¼ cup mint, bbq sauce, basil, oregano and 1 tsp garlic. Mix until combined and form into 12 meatballs. Place on baking sheet and bake for 15 minutes or until temperature reaches 160 F.
3. Meanwhile, cook orzo as you would pasta. Bring a pot of water to a boil and cook orzo for 8 minutes or just until tender to the bite. Drain and add tomatoes, olives, lemon juice, olive oil and remaining 1/3 cup feta / ¼ cup mint and 1 tsp garlic. Spoon orzo on serving plate, place meatballs over top. Garnish with remaining 2 tbsp feta.